Reference number for this case: 16-Oct-54-Orly. Thank you for including this reference number in any correspondence with me regarding this case. 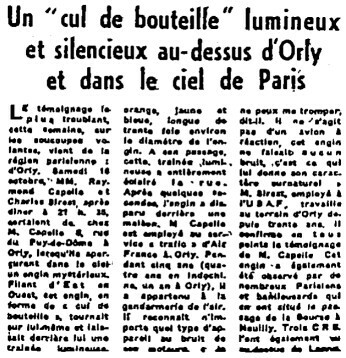 The most disconcerting testimony, this week, on the flying saucers, comes from the Paris area: from Orly. Saturday October 16, Misters Raymond Capelle and Charles Birest, after dining at 09:35 p.m., came out from Mr. Capelle's, 8, street of the Puy-de-Dome in Orly, when they saw in the sky a mysterious machine. Slipping by from East to West, this machine, in the shape of a "bottle's bottom", rotated and left behind a luminous orange, yellow and blue trail, long of thirty times approximately the diameter of the machine. At its passage, this luminous trail entirely lit the street. After a few seconds, the machine disappeared behind a house. Mr. Capelle is employed with the "traffic" service of Air France in Orly. During five years (four years in Indo-China, one year in Orly), he belonged to the gendarmerie of the air. He identifies any type of apparatus with the noise of its engine. "I cannot be mistaken, he said. It is not a jet plane, this machine did not make any noise, it is what gives it its supernatural character". Mr. Birest, employee with the U.S.A.F., worked at the Orly airfield for thirty years. He confirms in all manner Mr. Capelle's testimony. This machine was also observed by the many Parisians and suburbians who located the passage from the Stock Exchange to Neuilly. Three C.R.S. also saw it above Lagny. A veterinarian, three firefighters and two Orly employees add their names to the list of "those who have seen"
Paris. -- A veterinarian, two employees at Orly airport and three firefighters register on the long list of witnesses of celestial phenomena. At nightfall, while traveling by car, the commune of Baillolet (Seine-Inférieure) on R.N. 314, M. Henri Robert, a veterinary doctor in Londinières, saw four craft maneuvering one above the other, about 300 meters above sea level. Mr. Robert claims that one of them came zigzagging in front of his car, that he felt a strong electric shock and the engine of his car stopped. The veterinarian then saw a strange figure on the road about twenty feet high, the headlights of his car died out and when rhey re-ignited, a cylinder about three meters long took off the slope and took height at a tremendous speed. The two employees at Orly airport are MM. Raymond Castelle and Charles Birest who affirmed to their chiefs to have seen on Sunday evening a flying saucer crossing the sky of Orly "from East to West" at the speed of a jet plane, reaching the town of Paray-Vieille-Poste, that is to say, on the west-east runway, the mysterious craft, which, according to the witnesses, was moving at he altitude of 300 meters, stopped for about ten seconds while turning on itself and emitting rays that reflected intensely on the ground. As for the three firefighters, Captain Doussineau and Warrant Officer Serreau, they were driving on a road near Chatellerault (the Haute-Vienne) when they saw rise in the sky towards the castle of Targe, a large luminous disc. They stopped and observed the phenomenon at length. "The disc," they said, " passed above us at a few meters barely while emitting an high pitched whistling sound." It was inevitable and desirable that following the many occurrences of flying craft crossing the sky of France without interruption for weeks, a deputy addresses a Written question to the President of the Council. It was Mr. René Dejean, the Socialist deputy of the Ariège, who took this initiative, in particular asking "whether a department has been created or appointed to collect existing documentation on this matter and to study the nature and origin of such craft. "Wether the information currently gathered and recorded makes it possible to exclude the hypothesis of vehicles driven or controlled by living beings of unknown species and origin. "Whether the government has, on the contrary, sufficient information to attribute the production Of these devices to the industry of a foreign state. "Whether in the latter case, the international agreements signed by France have already allowed Consultations regarding the use of such devices in a potential conflict." Concerning specifically the observation in Orly at this time, Aimé Michel specifies that there were, among the witnesses, two employees of the Orly airport, one being a former member of the Gendarmerie of the Air and the other a member of the personnel of the US Air Force, and that these two witnesses thought that the object had stopped during one second. Aimé Michel notes that this impression of a short stop is frequent in the observations of meteors of big size. "Orly-Seine (at the time) - 09:30 p.m.: investigation. In spite of information provided in certain books, it was impossible for us to find the two witnesses." The author of the database indicates that in Orly, in the department of the Val-de-Marne, on October 16, 1954, at 09:35 p.m., several witnesses, among them operators of the control tower, observed an object in the shape of the bottom of a bottle, turning on itself and leaving behind itself a luminous orange, yellow and blue trail, long of thirty times its diameter, which entirely lit the street where two of the witnesses were. [fd1] Article in the national weekly newspaper France-Dimanche, France, October 17, 1954. [er1] Article in the regional newspaper L'Est Républicain, France, page 10, October 19, 1954. 1.3 Patrick Gross November 25, 2016 Additions [er1], [ub1]. 1.4 Patrick Gross December 12, 2016 Addition [fd1].